Elijah Zimmerman (9) with a header for Archbold Saturday versus Ottawa Hills in a Division III boys soccer district final. The Bluestreaks won a district title with a 2-1 victory over the Green Bears. ROSSFORD – Archbold coach Sean Stewart needed a spark. Playing top-ranked Ottawa Hills in a tied game with the minutes winding down in the second half, he needed just one big play. He got the big play from a sophomore who has made his share of them in his short two-year varsity career. 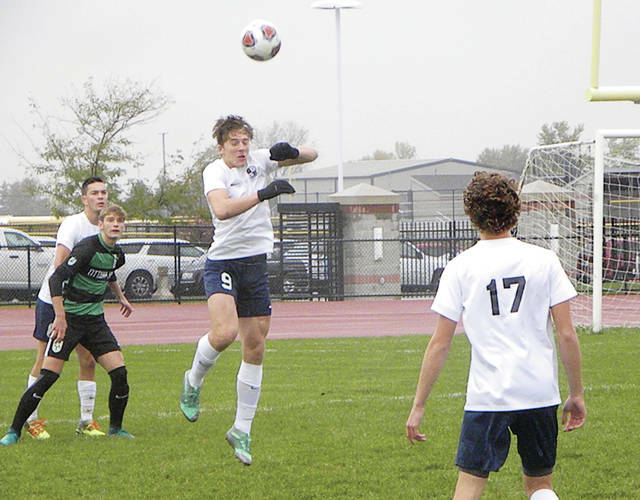 Trey Theobald stepped up and banged in a rebound shot past a prone Ottawa Hills keeper with 11:24 left in regulation Saturday to send the Streaks on to the regional with a 2-1 win over the Green Bears in a Division III boys soccer district final at a rainy Glenwood Athletic Complex in Rossford. The win avenged a 2-0 decision the Green Bears had over the Streaks in a game played in late August. To this point, it’s the only blemish the Archbold side has this season. Archbold did not have a lot of chances at the net in the second half. Needing just one opportunity to break the tie, the Streaks went on the attack after keeper Noah Cheney made a diving stop. Getting a shot on goal, Theobald crashed the net when the ball stayed in play on an Elijah Zimmerman shot and he finished up for the 2-1 lead. The Streaks turned to its defense at that point. Cheney was called on to make a handful of big stops to keep Archbold in front. It didn’t start off on a good note for the Streaks. Dylan Schreder poked a shot into the net for a 1-0 score for the Green Bears just 49 seconds into the contest. However, Archbold matched the goal a minute later when Andrew Hogrefe headed in a corner kick to tie the game. Both teams physically went after each other for the rest of the half, but nobody could muster a goal. Archbold (18-1) plays Kalida Wednesday at 6 p.m. in Findlay in a regional semifinal.